Bake for Happy Kids: Champion Garlic Bread!!! Having just one bite of these garlic bread, I know that I have found the garlic bread that my boy always want. Then quickly, I asked my boy to try one of these. I was watching my boy anxiously... staring every single moment of his first bite of these breads and leaning forward to hear his response. After a couple of munches, I feel good seeing his greasy smile and his greasy thumb up. Mummy, this garlic bread is delicious! With no doubt, I like to confirm that I have found the garlic bread recipe that we always want... and this is the one! 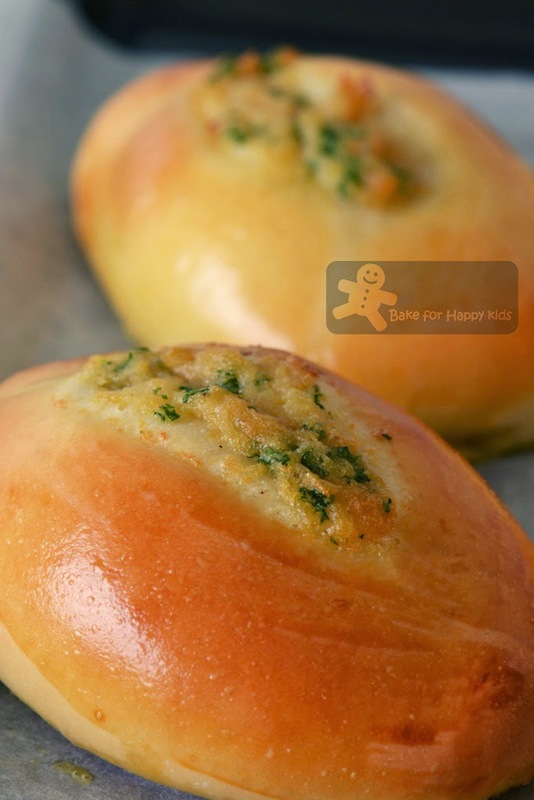 As mentioned in my previous post, my boy and I have searching around for a recipe that bakes the unforgettable "Singapore" garlic bread... The soft, buttery and fragrant kind of garlic breads like the ones we bought Mugiya bakeries in Singapore that make my son couldn't forget. Champion bread + garlic butter = champion garlic bread? 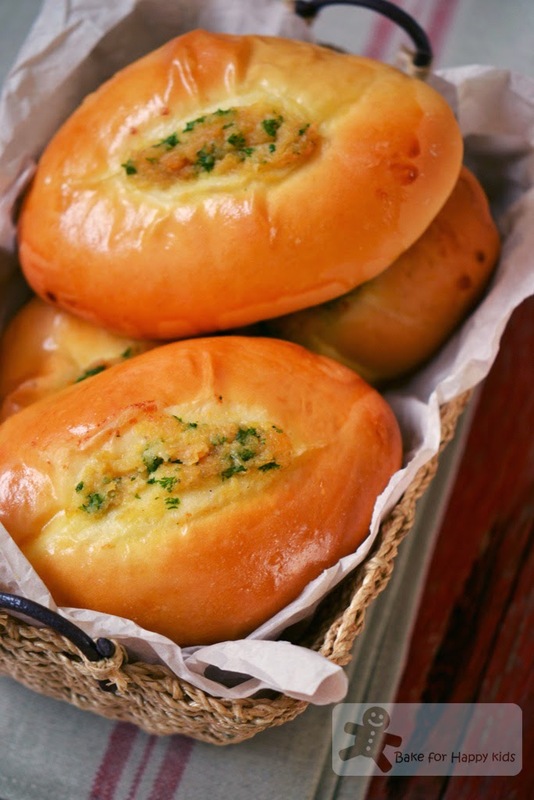 Can champion garlic bread be my son's unforgettable "Singapore" garlic bread? LOL! I kept asking myself. I know that the name sounds a little uncool and it is truly a champion recipe. Inspired by Paula Deen at here, I have made my garlic butter for these bread with roasted garlic and freshly chopped parsley which makes the butter more fragrant with extra nice, zesty and creamy garlic texture. Now, back to the question: Champion bread + roasted garlic butter = my boy's unforgettable "Singapore" garlic bread? This is the one. Our champion garlic bread!!! I always like to use the Spanish garlic to bake my garlic breads. For extra fragrance, I have roasted the garlic before adding it into the butter mixture. The bread dough is not sticky at all and easy to knead and handle. I shaped the rolls like the shape of my boy's "Singapore" garlic bread. More garlic butter for these bread... Yum! After baking... They smell very good! I have found it! This is indeed the champion garlic bread! By the way, if you are wondering who is Wu Pao Chun, you see his face at Esther's blog at Copycake Kitchen. I think he looks a little like Andy Lau to me... LOL! Preheat oven to 425°F or 200°C fan forced. Cut top off garlic head. 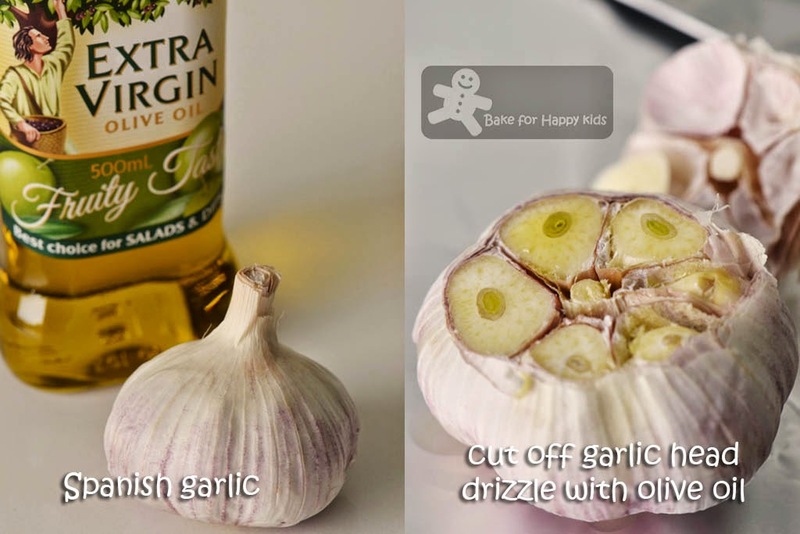 Place garlic on a piece of aluminum foil; drizzle with olive oil. Fold edges together to seal. Bake 30 mins and allow garlic to cool completely. Squeeze cooked garlic into a medium bowl. Garlic will be soft and sticky. Add butter, parsley salt and pepper, stirring to combine. Set aside and wait for the bread dough to be ready. *The milk in this recipe doesn't require scalding but need to be lukewarm or at least room temperature for efficient proving. Using a breadmaker, mix all dough ingredients and knead into a smooth and elastic dough and allow it to prove for 1 hr. 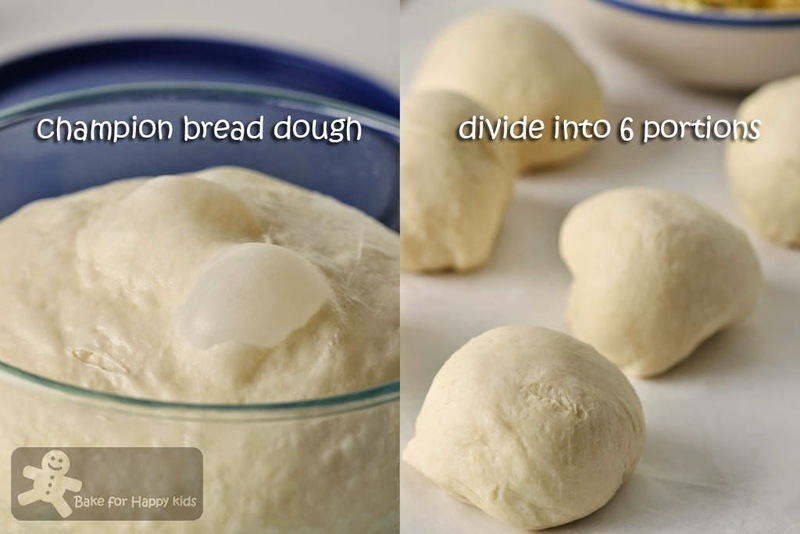 At this point, you can either store the dough in the fridge to use it on the next day or use it now. If breadmaker is not available, kneading by hand or electric mixer with a dough hook is possible. Using your hand or an electric mixer, mix all dough ingredients (except butter) to form a dough. If you are using an electric mixer, increase the mixing speed to medium low and knead the dough until it is smooth in its texture. If you are kneading by hand, you need good muscle and endurance to keep kneading until the dough is smooth. Mix in the unsalted butter and keep kneading at medium low speed or by hand (about 10-15 mins) until dough is elastic and can stretch to form thin and translucent membrane. Allow the dough to rise for about 60 mins or until doubled in size. At this point, you can either store the dough in the fridge to use it on the next day or use it now. Divide dough into 6 equal portions, then allow to rest for another 10 mins. 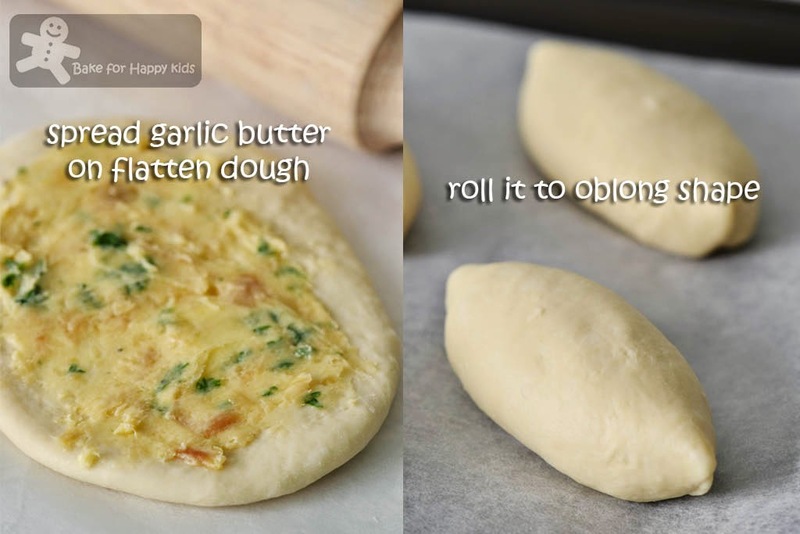 Flatten each portion of dough, spread a thin layer of garlic butter and roll it into oblong shape. Repeat the same shaping method with the rest of the dough. Place them on a baking tray lined with baking paper and allow them to rise for another 1 hr or until doubled in size. Chill the left-over garlic butter in the freezer until firm. Preheat oven to 180°C or 160°C fan forced. Beat both egg yolk and milk roughly with a fork until combined. 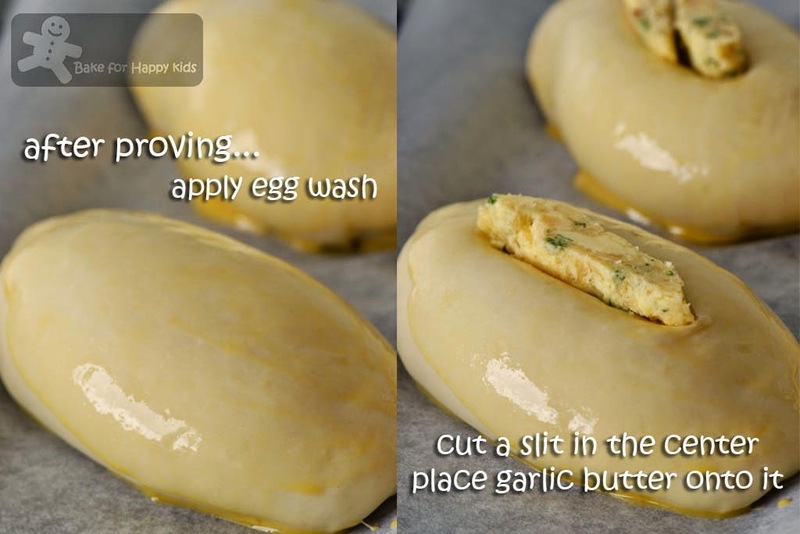 Apply egg wash on the surfaces of the dough. Cut the center of each with sharp knife. Place 1/6 of the frozen garlic butter onto the slit. Repeat this step with the rest of the dough. Bake at 180°C (or 160°C fan forced) for 17 mins or until golden brown. Transfer the breads immediately onto a wire rack to cool. Serve when they are slightly warm or at room temperature. As usual, the garlic bread looks delicious.. I mean, everything from your hands - from bread, cakes, cookies, to chicken, I really mean everything - looks so good and baked/cooked with lots of love.. Too much work for me, and if me, I'd buy from the bakery OR buy the "long" bread from the bakery, add my own butter into the bread, slice and bake, haha.. I guess you must be pleased to finally found your search of garlic bread. Thanks for this post as my hb has been asking for garlic bread too. I feel like I can smell the aroma just by looking at the pictures! These buns look so gorgeous! Wow! Looks really champion, so professionally done! I am going to try this too! I am very sure my boys will love this! I have tried this champion recipe before and liked the easy process. This recipe is definitley a champion! 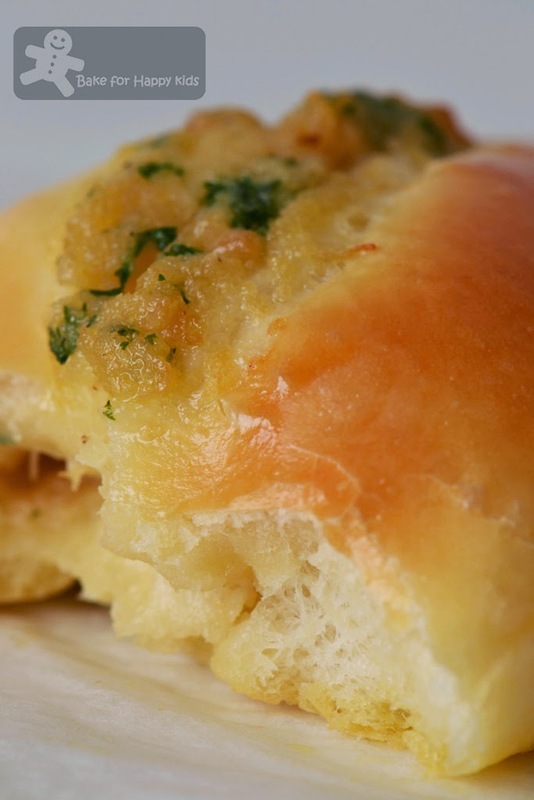 I love that you've got the garlic herb butter inside the roll so it's amazing with every bite and I'm sure it also melts besides tasting so good! I would love to make this, will be bookmarking this recipe! Your family are so lucky to have you! Wow, Zoe! Your Champion Garlic Bread is gorgeous! It has loads of buttery garlicky goodness. Yum! Oh my.. it does look perfectly delicious! 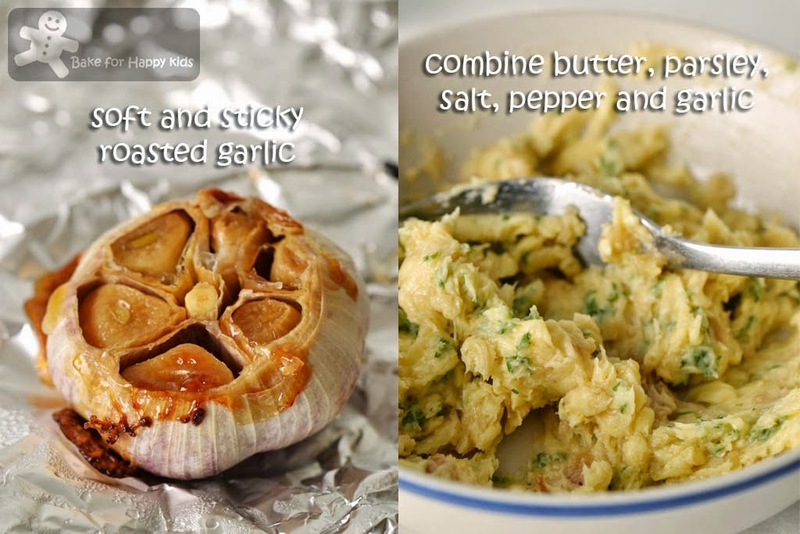 Brilliant idea of roasting the garlic, it sure made the garlic butter more fragrance. Yes now I've found THE garlic bread. Thank you so much for sharing, Zoe. I love the champion bread recipe too. I baked sausages buns with this recipe and it turn out well. Your garlic bread looks so good! Got to try this soon! I love how fluffy, soft, and nicely golden brown these buns turned out to be! The look of it has already set me salivating and yearning for some! That says a whole lot especially when I'm not a bread person. Great job Zoe! Ohhhh....I'm so going to try this! I love buttery garlic bread. Paired with Champion bread, this is a sure winner!! I'm too fan of garlic and this one is appealing me to bake. We have to squeeze the baked garlic, hope i'm getting it right we have to throw the outer skin, right? Wooo~~ I love garlic bread! That looks delicious! Is it BreadTop style? Oh, those rolls look fantastic! Looks amazing. I used to make garlic bread all the time for dinner. It is such a good treat. Z, you're a breadmaster. Look at these yummy li'l footballs! Now that I tracked back to my favorite garlic rolls...'be still my heart' LOL...gotta eat something...drooling over the insanely yummy rolls, and those bulbs of roasted garlic! I need to take a break!!! Hi Zoe, your shared recipe is so awesome! Very yummy...thank you very much! Hi can I ask how deep is the slit where the frozen garlic butter is set upon? I tried this but the butter just melts all over the edge of the bun as it expands in the oven, forming a pool of oil at the base. Nothing like yours. Thanks! Hi, I can't really tell you how deep you should cut your bread. Your butter has to be very well frozen and you have to push the butter deep enough into your slit. It will flow out a little but most of it will stay within the slit. Cheers! Hi.. i made this. And it really IS a champion. Thks for sharing..